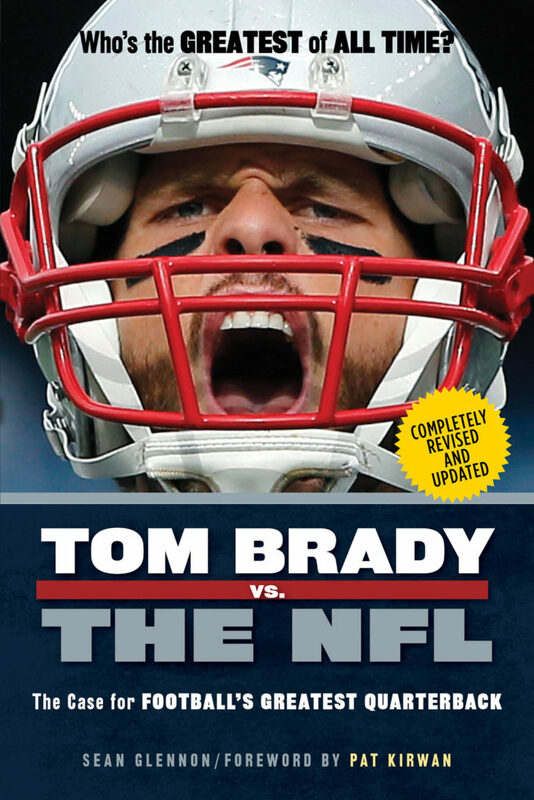 You know how you’ve been dying to get your hands on a signed copy of the new, updated, expanded, extra awesome second edition of Tom Brady vs. the NFL? You’re in luck. Or at least you are if you’re within striking distance of one of my upcoming events. I’ve added three events over the last week or so. You can get details, links for directions, and all of that stuff on the events page. Saturday, October 8, Barnes & Noble in Burlington, Mass. Saturday, November 19, Barnes & Noble, Bellingham, Mass. Saturday, December 17, Barnes & Noble, Hingham, Mass. I’m excited about all of these for a variety of reasons. Burlington will be the first time I get out there with there with this new edition. I’m pretty proud of this book, so I’m looking forward to talking to readers about it. This event also comes on the eve of Brady’s return to the field following his ridiculous, wholly unwarranted Deflategate suspension. So, you know, you can come out, pick up the book on Saturday morning/afternoon, jaw with me a bit about Brady’s return (or whatever’s on your mind), then go home and read up about the GOAT in preparation for watching him take out his frustrations on the Cleveland Browns the next day. Bellingham will mark a sort of homecoming for me. I grew up two towns over in Milford, and in high school had lots of friends from Bellingham. (Maybe I worked with you at the Big D. If not, maybe I bagged your groceries there. Or your family’s groceries. I hope I didn’t break the eggs. Or if I did — because I probably did — I hope sometime over the last 33 years or so, you’ve found it in your heart to forgive me.) This is as close to my hometown as I’ve ever got for an event open to the public, and probably as close as I’m likely to get, so I’m pretty psyched about it. Maybe I’ll see some familiar faces. Hingham is a really, really cool event. You’ve got to get there if you’re a fan of the Patriots or the Bruins — or if you have Boston sports fans on your holiday gift list. In addition to me, you’ll have a chance to meet Erik Frenz, author of the brand new Bill Belichick vs. the NFL and Boston Globe NHL reporter Fluto Shinzawa, whose book The Big 50: Boston Bruins will be published in November. This should be a lot of fun. I know I’ve been excited about Erik’s book for some time (and, no, not just because I’m the creator of Triumph Books‘ person vs. sport/league book series concept — it’s mostly because Erik’s a fine writer and his book focuses on one of my favorite subjects). And Fluto’s a hell of a reporter and writer, so you know his book is going to be a great read. Keep in mind, a signed book makes a great holiday gift. Plan to come out. Familiar face or new friend, it’ll be great to see you. You didn’t even know I was working on an updated, expanded second edition of Tom Brady vs. the NFL, did you? Of course not. Because I didn’t tell you. That’s partly because I have this thing where I don’t like to talk about a book until it’s done. And it’s partly because I’m sometimes not so great at the whole having a web site thing. But, hey, here we go. There’s a second edition. And I’m pretty psyched about it. Books have shipped. Amazon’s selling and shipping copies now. (Probably some other online retailers are, too, though Barnes & Noble isn’t quite yet.) And they’ll probably start showing up on the shelves at brick and mortar stores any day now. Here’s what the awesome new cover looks like. And now you’re wondering, other than the much better cover (not that the old one was bad; this one’s just better) how’s the second edition different from the first? Chapters from the first edition have been revised as appropriate. In the case of the Sid Luckman chapter, that mostly means I brought Brady’s career stats up to date and adjusted some of the language about where Luckman stands in Bears history. (He’s still the best QB who ever played for Chicago, but he no longer holds all of their volume passing records.) In the case of the Peyton Manning chapter, that means an almost complete rewrite. Because so much has changed for both Brady and Manning since 2012. In the case of the Joe Montana chapter, it’s a substantial rewrite that no longer comes out to Brady’s probably better, but Brady’s definitively better. (You saw Super Bowl XLIX, right? I mean, there’s other stuff, but that was kind of a big moment.) The chapter about other Super Bowl-winning QBs currently playing in the NFL also got a top-to-bottom rewrite (because, again, 2012 was a long time ago — at least in professional athlete years). A whole huge, long list of league records and team records and career milestones that Brady has hit since the first edition was published. 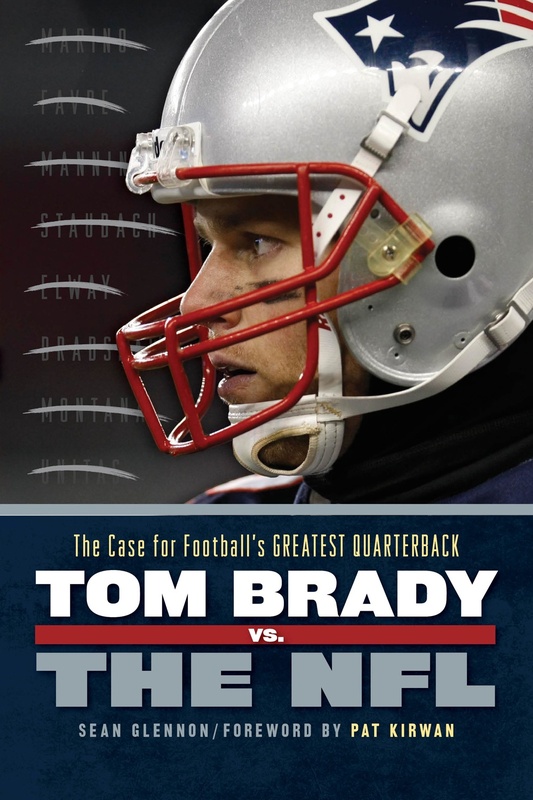 And, uh, because I had to (thanks, Roger), there’s an author’s note that deals with Deflategate. Stupid. Pointless. Deflategate. So there you go. Get out there and buy a copy. You know you want one. (By the way, so does your dad. And your sister-in-law. And … well, you know, everybody. And the holidays will be here soon enough.) Go. I know. That doesn’t even pretend to rhyme. Worse yet, there’s no fair. Just shopping centers. But they’re both very nice shopping centers, with awesome book stores that have invited me in to sign copies of my books just for you. And if you come out, I can tell you that I’ll happily dance the hoochie-koochie. So there’s that. OK, let’s get to it. Two events on tap. Come out. We’ll talk Patriots and playoffs. I’ll sign a book or two for you. Saturday, January 9, Barnes & Noble in Holyoke, Massachusetts. I’ll be there from noon to 2 p.m.. That will give you plenty of time to get your Patriots fix while the team enjoys a wild card round bye — and get to wherever you like to watch football before the first game of the day, Chiefs-Texans, kicks off at 4:35 p.m.
Saturday, January 23, Barnes & Noble in Millbury, Massachusetts. It’s Conference Championship weekend, which means no games on Saturday. So you’ll stop over sometime between 2 and 4 p.m. and we’ll talk Patriots football — past and, with any luck, very near future. For more info, including links to directions, head to my events page. Otherwise, you know. I’ll look forward to seeing you at one of the events. Western Mass: Who Loves Ya, Baby? Forget that headline. It’s just my cynical attempt to win over Kojak fans. I’m like that. Here’s the deal: I’ve got two great signing events coming up right here in my own back yard. Details, with times, links to directions, and all that, on my events page. The first happens Saturday, December 19 at Barnes & Noble in Hadley. I had a great event at that store just a few weeks ago (the Saturday after Thanksgiving), but we ran out of books pretty early on. So they asked me to come back. I’ll be in the store starting at 2 p.m. Come on out and say hello. We’ll talk Patriots. And if you’ve got a Patriots fan or two on your holiday gift list, you’ll be in luck. Because a signed book makes an awesome gift. Next up: Barnes & Noble in Holyoke at noon on Saturday, January 9. That will be the first day of Wild Card weekend, but the Pats almost certainly won’t be playing. (Yeah, yeah, yeah. I don’t believe in jinxes.) And the early game that day won’t start until after 4. So you come out, talk about the playoffs, grab a book or two with the gift card you picked up during the holidays, and get home (or to the bar) in time to take in some great postseason football. Two exciting events to tell you about, one in my home market and another teaming up (again) with my friend and fellow author Richard King. This is great news for those who were unable to come out to see Rich and me at Trident Booksellers & Cafe November 3. Rich and I will be reading, speaking and signing our respective books on Saturday, November 21 at Yellow Umbrella Books in Chatham, Mass. So there’s your excuse to spend a nice fall afternoon on Cape Cod. If the Trident event set the tone, we’ll get a nice conversation going between me and Rich. I’ll talk about Patriots history and read from The New England Patriots Playbook. 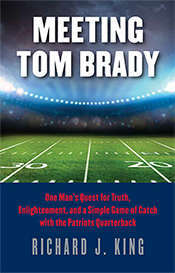 Rich will be talk about, and read from, his fantastic memoir, Meeting Tom Brady. We’ll do some Q&A. And we’ll sign books. And, you know, as I’ve said before, come out even if you’re not a Patriots fan — or even a sports fan. Why? Well, first of all Meeting Tom Brady is not a sports book. It’s not really even a book about being a sports fan, though it sometimes masquerades as one. It’s a book about facing middle age and mortality. It’s about wanting to understand oneself and ones passions. About allowing oneself to want something even as you try to understand your own desires. Rich is a terrific writer and he’s published a really fine book. So if you like that kind of thing, you know, you should come out. And if you don’t love good writing, and you’re not a sports fan, you should still come out. Because the holidays are coming and I’ll bet you’ve got at least one Patriots fan on your gift list. As you may have heard me mention once or twice, a signed book makes a great gift. A week after that, I’m down the street from home at Barnes & Noble, Hadley. That’s Saturday, November 28 at 2 p.m. I’m always excited to do an event in my home market. Love that I get to see friends. Love that I get to meet Patriots fans from Western Mass. Break away from whatever it is you’ve got going on that afternoon and stop by to say hello, talk Pats, and pick up signed copies of Playbook and Tom Brady vs. the NFL for yourself and your favorite Patriots fans. For contact info and links to directions, visit my events page. I can’t begin to express how excited I am about my upcoming dual event at Boston’s amazing Trident Booksellers & Cafe with my friend and fellow author Richard King. 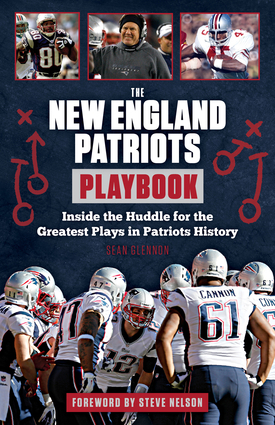 Tuesday, November 3, 7 p.m.
I’ll be reading from The New England Patriots Playbook, talking about Patriots history. Rich will be reading from and talking about his terrific memoir Meeting Tom Brady. And I expect we’ll both answer some questions. Come out to say hello and talk Pats. Come out to pick up your copies of our books for your own library. Come out to grab some copies for your favorite Patriots fan. A signed book makes a great gift. Seriously, don’t miss this one. It’s gonna be a great night. I promise. I’ve started making the rounds promoting The New England Patriots Playbook. I’ve also been out there in the electronic media. Stopped by Fox 25 in Boston recently to talk to Tom Leyden about the book. I don’t have the segment that aired on Sports Wrap, but here’s the entire unedited interview. Also spent time on the phone with Roland Lajoie of “Vermont Country Morning” on 93.9 WLVB-FM in Morrisville, Vermont. Here’s that’s spot. There’s more on the way. Stay tuned. Well, it’s at my house anyhow. Could show up at your local bookstore any time. Even though the official release date is September 1, once stores have it, they can sell it. As I’ve noted before, The New England Patriots Playbook, updates Game Changers: The Greatest Plays In New England Patriots History with exciting new material. It also features a great new layout. There are some fun new chapters that cover the biggest moments from the five years since Game Changers was published — right up to the amazing Malcolm Butler’s interception that cemented the Pats as Super Bowl XLIX champions. There’s new material on Gronk and Edelman. There’s additional material on Wes Welker and the disappointing end of his tenure with the Patriots. There’s gorgeous photography and a bunch of play diagrams that weren’t in Game Changers. And it’s all in a nice new format that makes it easier to read and travel with than Game Changers. I’m pretty psyched. Neither Amazon nor Barnes & Noble.com has made it available yet, though both are taking preorders. When you see it out there on the shelves at your favorite bookstore (or in your local supermarket) drop me a line to let me know. Still, I’m pretty excited that I’ve had a chance to update another of my books, one that remains a personal favorite — partly because it was so much fun to write and partly because it’s been so well received by readers. Here’s the deal: This fall, Triumph will release The New England Patriots Playbook, which is an update, with exciting new material and a great new layout, of Game Changers: The Greatest Plays In New England Patriots History. I’ve added new chapters and sidebars that cover the biggest moments from the five years since Game Changers was published — up to and including Malcolm Butler’s spectacular, game-winning interception at the end of Super Bowl XLIX. There are new pieces about Gronk and Edelman, and a final look at Wes Welker’s by turns amazing (mostly) and disappointing (at the exact wrong moment) time with the Patriots. And Triumph has created a gorgeous new presentation for material old and new, including beautiful photography and a bunch of play diagrams. The format is more compact than Game Changers, so it’s easier to read (particularly if you do a lot of reading on the go) — and, as important, this format is perfect for e-readers. And if you’re so inclined, you can pre-order (I don’t really like that phrase, but whatever) a paperback copy now on Amazon or Barnes & Noble.com. Be sure to tell your friends. Spent some time in the studio at my old haunt, 93.9 The River, this week talking to Monte Belmonte about the Patriots, Tom Brady, my books, and, of course, Super Bowl XLIX. Monte (once again) put together a segment that makes me look like I know what I’m talking about. That’s no easy task, let me tell you. It’s a fun segment, and worth a listen if you have a few minutes.